Blue Skies Above A lighten Tree- (Liverpool, NY- 2010-Bryan Matthew Boutwell-Residential Remodeling and Interior Design Instillation.) 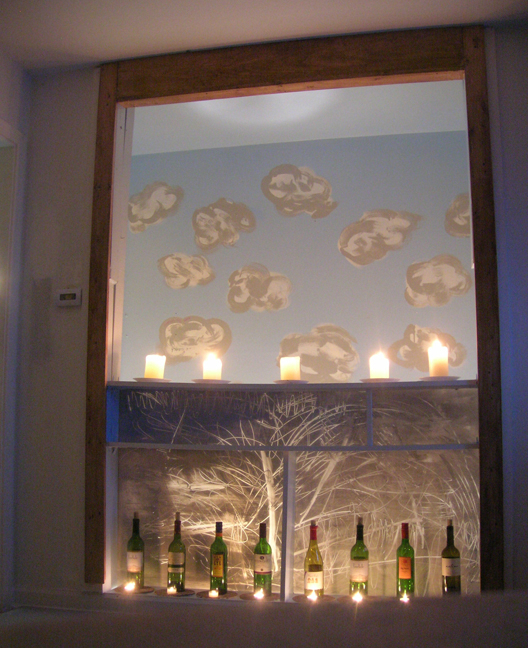 This photo is of a residential instillation I created. Winter in Central New York is one of the most brutal ones in the country. It lasts 6 months and the sun rarely shows up. The temperature stays between -15 and 32degrees. People start to get really depressed around mid January. I created this particular scene in a client’s living room as a way of combating the sunless sky outside of their home. I wanted to create a scene that felt warm, soft, and easy on the eyes. My aim was to create as much natural light as electrical light. I wanted the ambiance to reflect a surrealistic daydream involving the perfect outdoor day. Even if the people residing in their home had to battle the elements of winter every time they left their home, they could at least enjoy the atmosphere and view from the inside.